We are a group of friends who got into a fitness regime. We participated in 5K run events in local areas. We made a day of the occasion because we enjoyed the sense of achievement we felt when we crossed the finish line. We always ran for charities; Breast Cancer, Leukemia, Hemophilia, Melanoma or some type of Memorial run. This made race day a win/win for all of us. 5k runs quickly turned into 10K runs. Shortly after, we were purchasing road bikes and then swimsuits, goggles and wetsuits. We were transformed into Triathletes. In 2011, we agreed that Le Roy was a great place to host an event like a triathlon and so Tri the Oatka Team Triathlon was created and is held every July. Shortly after that, we added the Jinglin All the Way Festive 5k which is held every year on the first Saturday of December. Proceeds from our events are given back to our community. Since 2011, we have donated more than $14,000 to various programs such as the Leroy Community Pool, LCCP, Sunshine Nursery School, Love Bugs Pre-K Program, The Le Roy Food Pantry, Grace’s Kitchen, Le Roy Nursery School, Wolcott Street School, Le Roy High School, and have given four scholarships to a Le Roy high school senior. We believe in living a healthy and active lifestyle and giving back to the community that we live in. 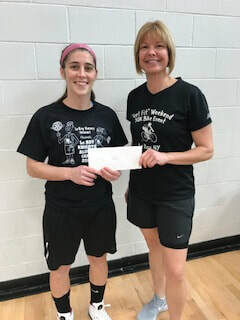 A donation made to Reilly Condidorio in memory of her mother Cris. To learn more about the memorial fund, click on the picture above! Pictured above is daughter Reilly Condidorio and Tri the Oatka committee member Tami Loftus. One of our 2017 donations to Mrs. Horgan's Health Class, Mrs Horgan's freshman class will be CPR certified and the donation will cover the cost. Pictured here is Ellie Dambra, Maddie Keister, and Tri the Oatka committee member Amy Vanderhoof.